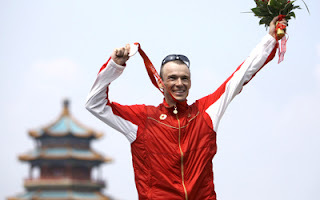 Victoria's Simon Whitfield, a veteran triathlete, has been selected to be the Canadian Olympic Team flag bearer for the London 2012 Olympic Games' Opening Ceremony on July 27, 2012. The announcement was made today on Ottawa's Parliament Hill, and was a pomp-filled event complete with Canada's Ceremonial Guard. Whifield was accompanied by his mother, father and sister and spoke to the crowd with humility. His hometown of Victoria is justifiably proud, and the honor was front page news in the Times Colonist. Whitfield said it was a "huge thrill" to receive the call from his Olympic hero, Mark Tewksbury. "Once I got over the shock of how cool it was that Mark called, my thoughts turned to all of the incredibly talented Canadian athletes on this team," said Whitfield. Tewksbury, the 2012 Canadian Olympic Team Chef de Mission, said Whitfield was "truly a fitting representative of this year's team." The two-time Olympic medalist won gold in the first ever Olympic Triathlon event in Sydney in 2000 and earned a silver in the event four years ago in Beijing. In addition to his Olympic medals, his career has earned him 14 World Cup victories and 21 podium finishes, along with seven top ten finishes at World Championships and ten Canadian National Championships. He also carried the Maple Leaf into the Closing Ceremonies in Sydney. The 2012 Canadian Olympic Team consists of 277 athletes representing 10 provinces and territories, competing in 26 sport disciplines. The team includes 93 coaches and 137 staff and volunteers.